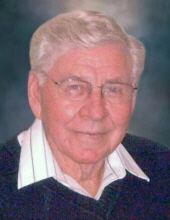 Visitation will be from 4:00-7:00 PM on Sunday, April 7, 2019 at Conway-Markham Funeral Home in New Hampton and will continue at the church one hour prior to the funeral service on Monday. Online condolences may be left at www.conway-markhamfh.com. Memorials may be directed to Jerico Evangelical Lutheran Church. Paul Lowell, second son of Ole and Alice, was born July 30, 1929. He grew up on the family farm in Howard County, tending to the animals, working in the fields, and getting into only as much trouble as one would expect from a Norwegian farm boy. He left home for two years (1952-54) when he served in the Army during the Korean conflict, receiving an honorable discharge at the rank of sergeant. In 1961, after thinking it over for some time, he married Eileen Gaffney of New Hampton on November 14th. Together they began two decades of working together to run the family farm. Their daughters Jane and Karen blessed their marriage. The rhythm of their lives followed the seasons, some years were plentiful and others were lean, but they managed to keep the family and farm running smoothly. In 1980, Ole’s death and the high prices of farmland put an end to Paul and Eileen’s days on the farm. The family moved to New Hampton in 1981, changing the rhythm of their family to shifts, paychecks, and keeping up with their every busy daughters. It wasn’t always easy and they often missed the farm, but Norwegians seldom despair. Paul found steady, if not stimulating, work at Sara Lee in New Hampton. Paul and the girls lost Eileen to a brave battle with cancer in 1993. Anyone who questions the value of living in the same place for your whole life should know that the outpouring of support from family, friends and neighbors helped the family through their grief and helped Paul find a new rhythm to his life. He found friends to visit, volunteer work to do, social events to attend, and neighbors in need to help. Soon Jane and Karen purchased an answering machine for Paul because he was so rarely at home to pick up the phone when they called. The arrival of his grandchildren gave Paul a legitimate excuse to fill his home with toys and keep chocolate in every room. He also found a true friend and soul mate in Mary Jean Martin, who’s shared his joy for socializing and genuine desire to help those in need. When the girls and their families traveled home for a visit, the kids would have a wonderful time with Grandpa and get into only as much trouble as one would expect from the descendants of that Norwegian farm boy…who was always a kid at heart. To send flowers or a remembrance gift to the family of Paul L. Johnson, please visit our Tribute Store. "Email Address" would like to share the life celebration of Paul L. Johnson. Click on the "link" to go to share a favorite memory or leave a condolence message for the family.